This foliage-rich bag echoes the leafy imagery that is often found on many tarot cards. With shades of green that range from new spring leaf to pine forest It's the perfect bag to pair with a deck that follows a nature theme. 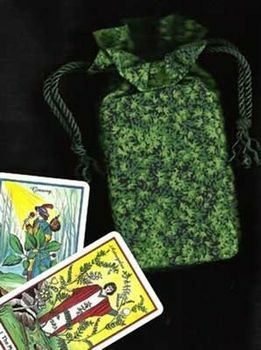 It is shown below with two cards from The Herbal Tarot by Tierra and Cantin. 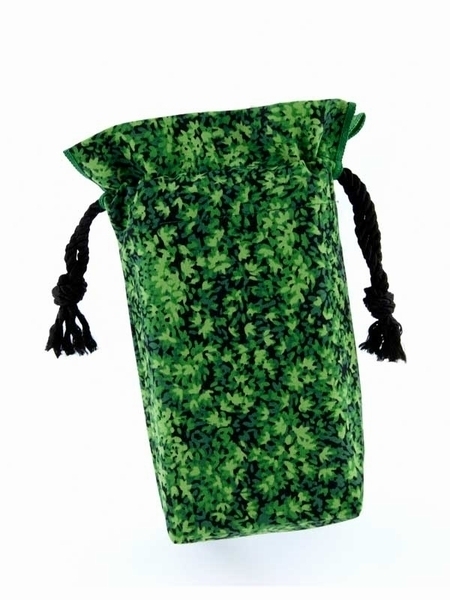 Design: Our popular and elegant Double Draw Bag design features squared off (gusseted) bottom corners to better fit a deck of cards, rolled hem finishing on all edges and seams, and a reinforced double drawstring closure that creates a 1" ruffle effect. Fits most standard sized tarot card decks, 3-1/4" by 5-1/2" and smaller.